Chennai Super Kings 3-200 (Michael Hussey 95, Suresh Raina 44, Rajat Bhatia 1-31) beat Kolkata Knight Riders 4-186 (Manvinder Bisla 92, Eoin Morgan 32*, Mohit Sharma 1-23) by 14 runs. Chennai Super Kings amassed 200 runs with seven wickets remaining at the end of the stipulated 20th over and Kolkata Knight Riders were restricted to 186 for the loss of four wickets. 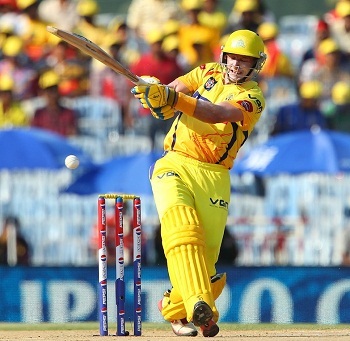 Michael Hussey (Chennai Super Kings) was declared ‘Player of the match’ for his absorbing knock of 95 from 59 balls. The 38th match of the Indian Premier League was played on Sunday, April 28, 2013, at MA Chidambaram Stadium, Chepauk, Chennai. Earlier, Gautam Gambhir, the captain of Kolkata Knight Riders, won the toss and preferred to chase on a good looking surface. Wriddhiman Saha and the experienced Michael Hussey opened the innings, the latter was in a dangerous mood and started off with 3 fours in the third over. Saha joined him by hitting 1 six and a couple of fours in the very next over and the boundaries were showering from the bats of the two. The duo added 1 six and 4 fours in the next two overs and Michael Hussey completed his fifty in the 8th over on the 31st ball he faced. The first hundred of the innings was displayed on board in the 10th over and Saha was caught by Eoin Morgan at deep midwicket off Rajat Bhatia for 39 scored from 23 balls with 2 lofty sixes and 4 fours. Suresh Raina joined in next with Hussey who continued slaughtering the rival bowlers at will as the first hit 1 six and 1 four in the 14th over. The score was enhanced to 158 in 15.5 overs when Michael Hussey was caught by Debabrata Das at deep midwicket off Sunil Narine for 95 from just 59 deliveries with 2 big sixes and 11 fours. The Chennai Super Kings skipper, MS Dhoni, walked in next and kept the score board running briskly. The score was taken to 190 as Suresh Raina was run out for 44 off 25 with 1 six and 4 fours. Manvinder Bisla and Gautam Gambhir came together for the chase and took off nicely by scoring 32 runs off 2.4 overs. Gambhir was clean bowled by Chris Morris for 14 and was replaced by Brendon McCullum as Bisla punished Morris for 4 fours in the fifth over. The score reached 63 in six overs when the stumps of McCullum were dislodged by Mohit Sharma for just 6 runs. Jacques Kallis was the next batsman in as the rival bowlers checked the run rate with accurate bowling. Kallis hit the first six of his innings in the 11th over but was gone at 99 after contributing 19 runs. Eoin Morgan associated with Manvinder Bisla who attained his fifty in the 14th over with 2 fours. The pair kept the chase on as Bisla was the most attacking of the two and accumulated 4 fours in the next three overs. 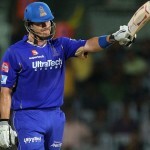 The batsmen were severe on Dirk Nannes in the 18th over and gathered 21 runs comprising 2 sixes and even fours. Manvinder Bisla was unluckily run out for 92 off 61 with 2 sixes and 14 sweetly timed fours and the chase was abandoned after his departure. Eoin Morgan scored 32 off 22 balls with 2 sixes and 2 fours as Kolkata Knight Riders managed 186 with six wickets intact in 20 overs. Mohit Sharma, Chris Morris and Dwayne Bravo were the only wicket takers with one wicket each. 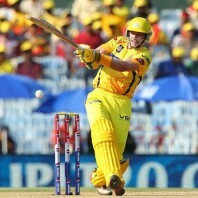 Chennai Super Kings won the exciting match with a narrow margin of 14 runs and earned two points.